art plate, originally uploaded by Seligman's Dog. The 12 days of xmas to us is the gap between xmas and new year's in which daycare is closed. It is a fun, yet challenging period of the year. Mom's taking the brunt of the childcare while I work. This afternoon's activity (among many) was paper plate painting. Not especially environmentally friendly, but fun. And, I was desperate. Today, a twist. 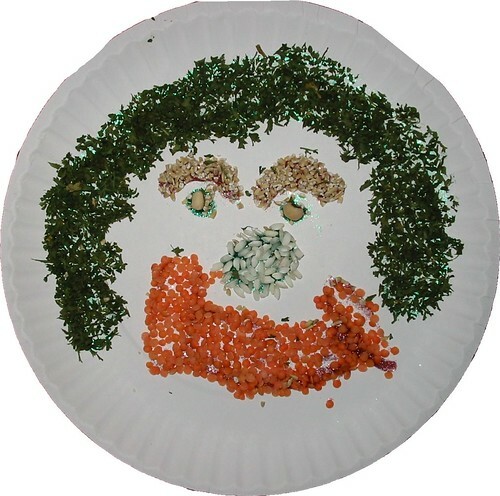 I use a ton of grains, herbs and spices while cooking and this activity took place in the kitchen (near lots of running water and cleaning supplies). Combining the painting with the many ingredients at our disposal, we created this multi-textured piece of art. First we applied glitter glue and then coated each section with a different material. Hair: dried parsley. Eyebrows: steel cut oats. Eyes: blackeyed peas. Nose: arborio rice. Mouth: orange lentils. Pretty cool result.